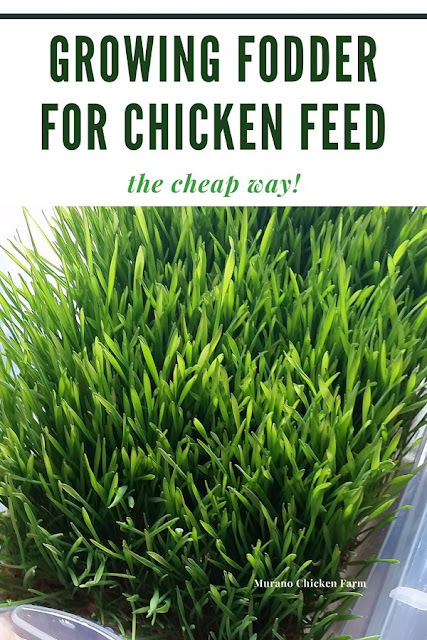 I'm sure by now you've seen all the posts about growing fodder for chicken feed. You've probably also read (or participated) in the countless forum threads happening on various chicken sites. I'm not going to bore you with the details you've probably already read. Instead, since I'm frugal I'm going to show you how to do it CHEAPLY. I've seen some beautiful fodder systems, but many of them seem to be either very expensive to build (yes, I said build) or they happen to have access to a lot of raw materials that most of us don't have. I have to say I am mighty impressed with the automatic watering systems some have set up, but I can't wire a darn thing to save my life! So let's start with the easy-peasy cheap way to do it. Then you'll need a big cup to pour water and a strainer (I had extras in the kitchen, the dollar store has them) At first I used whatever extra containers I had laying around, but this gave me various sizes of finished feed. I switched to aluminum baking pans from the dollar store. A 2 pack of 13X9 disposable baking pans was only $1. I also use a plant sprayer that I bought at Walgreens last Summer for $1. I set the whole thing up on the top of my dryer in the laundry room. You need a temperature of about 60-70 for fodder to grow well, my laundry room stays about 60 in the winter. I think my husband would kill me if I tried to set up in any other room though! The directions are pretty simple. Pour some seed in the bottom of a pan and cover with water. Let sit about 12 hours and rinse. Drain excess water. Rinse it through the strainer and just toss whatever falls out back in. Rinse a few times a day for 7-9 days then feed to the chickens. I found it's harder to rinse the first few days until the seeds start to form a 'mat' of roots. In the first few days I use the plant sprayer to mist several times a day and only rinse twice a day so as not to disturb them too much. Just toss back in whatever falls in the strainer. Once they have a good root mat and about 1/2 inch of growth I rinse a few times a day and just tip them to drain. I move them out of the laundry room around day 6 or 7 and put them in my office window to finish up. Plants give off oxygen, right? I figure they do me some good sitting in a room I always use, plus seeing something green keeps me from having the winter blahs! This whole thing cost me about $20 including the seed. When I weighed the pan at the start it was less then 1lb....on day 9 it was 6lbs! That's a big change. Think about that...it's over 5 lbs of 'free' feed! I go through 3 bags of feed a week this time of year, so any dent I can put in the feed bill is much appreciated. Fodder was a huge part of how How I Saved $450 On My Feed Bill in 2016! Wheat fodder is an excellent source of nutritious greens for your chickens. In fact, your cat will love it too! 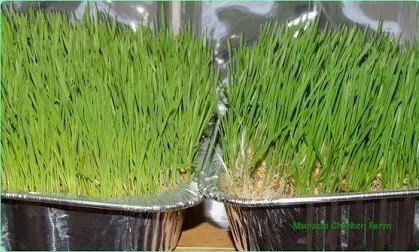 Check out this post: Growing Cat grass. If you're on a health kick, you can even make wheat grass juice for yourself! I think I'll just feed it to the chickens though! Want to know more about feeding chickens? Click here for my other posts on growing & making chicken feed.! This post contains affiliate links. If you chose to purchase something through the link, I will get a small payment from Amazon. It will not affect your purchase price. Click for full disclosure. I bet the chickens LOVE this, especially in winter. Visiting today from the Dandelion House. They do! It's not something I would keep up in summer, but works great to lower the feed bill and add greens in winter. Love the idea of aluminium pans. Will do over winter! Our chooks would sure appreciate the tip bits. Contrary to your introductory comments, I have actually never heard of any of this! Thank you so much for sharing this great idea! It looks like in your second-last photo that you are staggering the process so that you have some becoming fully grown on different days - so brilliant! You're welcome! You should try it! There is a 150 page thread on BYC with some amazing systems if you want to take a look. Yes, I start a fresh pan every day so I have a new pan ready to feed every day. I am inspired! Thanks for sharing. Very cool. Can you show pics on the rinsing and straining process? How many birds are you feeding every day? Ack! So many questions. I'll stop now. Thanks for sharing. Thanks! I will work on pictures! 1 pan for 80 birds at breakfast time. They still get their regular feed for lunch and dinner. I pull it apart a bit for them, but they gobble it right down! Great post!! I'm definitely going to have to try this! My poultry will love it!! I didn't realize it could be so simple to get them fresh greens (at low cost) in the middle of winter. Try it! It works fast and it's easy. Love this idea and you make it seem completely doable! Gonna check out what seed my feed store has on my next visit! Give it a try...it's is super easy! Do these need light or just warmth? Are you "rinsing" just to water them, or rinsing to wash something off of them? Could you collect the water you're rinsing them with and use it again the next day or more other trays, or is something being rinsed into it that would make the water unusable? I have mine by a window so they get indirect light. I don't give them warmth but the are in the house. They get slimy if you don't rinse them and that starts to smell. You'll want to use fresh water each time. I haven't experimented with using that runoff to water other plants but it seems like it would be beneficial. Your welcome! I enjoyed your posts on the same topic too! I started mine today. Hope this works! Im not sue what grains they are but the lady at the store said they would sprout! Thanks for sharing at The Green Thumb Thursday Garden Blog Hop. We hope you will join us again this week. I have often wanted to grow fodder for my chickens but I did not want to purchase many supplies. This is a very doable system that I may give a try. Thanks! Give it a try! It's a cheap and easy start-up. If you find you really like it, you can always expand to a larger system. Is it 5lbs of free feed or just water weight? I understand that it is more digestible but don't you have to account for how much they could digest before and how much they can digest after instead of just weight? Well, I start with about a pound of seeds in each pan. I end with 6 pounds of growing wheat grass after you drain the water. That is what they're eating...6lbs of greens with the seeds still attached. Same digestive process as eating grass and seeds outside. You just got those extra 5 lbs by rinsing the seeds for a few days. Give it a try, you'll see what I mean! So you take it out of the pan to feed them ?? Or do you trim and let it keep growing? I take it out of the pan and break it into clumps for them. They just pull it apart from there. You could trim it maybe once or twice, but since there is no soil or fertilizer the seeds will run out of nutrition within a few weeks and die off. So you refill the water each time you rinse? Yes, I do. 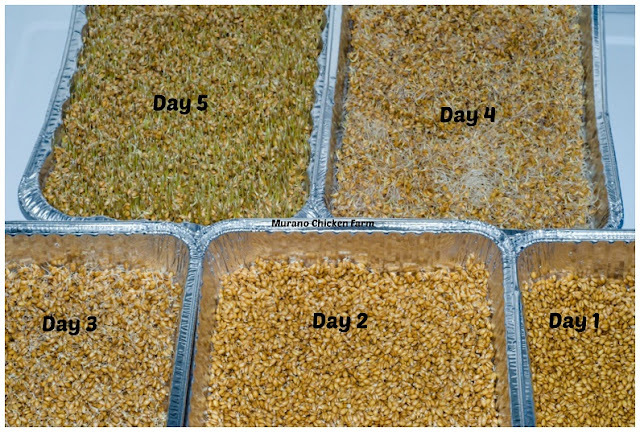 The water in the fodder pans will start to stagnate very quickly if you don't dump it out, but the seed does need water to continue to grow. You're basically just switching out the old water in the fodder trays for clean water. Hope that helps! Brilliant! Easy and cheap vs $30/wk. Anything I can do to knock that feed bill down I'm doing. I have a question - can I use rye berries? Yes, you can use grain rye to grow fodder. It should be about the same as the wheat berries I used in the pictures.